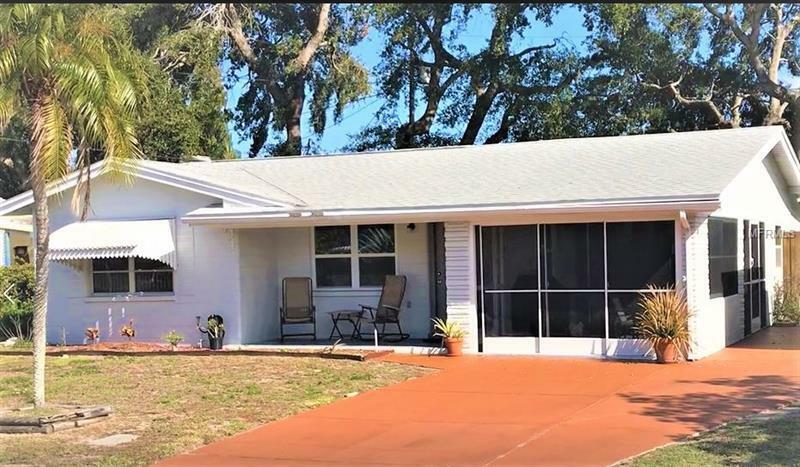 Snowbird or Home Buyer, come look at this cute Centrally Located home perfect for a Full Time or Winter Vacation Home, just 2 miles to the beaches. All shopping close by: Walmart Super Center, Seminole City Center, Publix’s Grocery, Restaurants, Veterans Administration regional facility and health care providers all within 1/2 to 5 miles. The interior was totally remodeled in 2014 to include: the Kitchen, Bathroom, Granite counter tops, Tile flooring, ceiling fans and screened room. This three bedroom, one bath home offers a great functional Open “warm” floor plan being sold with ample (most) selected furnishings. The 3rd bedroom can easily be used as a Den or Office. Nice indoor laundry room that adjoins the rear door accessing the easily maintained fenced yard, with dog door entrance (10-30 lbs. compatible). Newer Central Heat pump 09/2014. Water Heater (2016), very affordable utility bills. Large newer Storage Shed (2016), hurricane compliant. This is a lovely home, please call to set-up showing, you will not be disappointed.